Pundits who dismiss MERCOSUR and the Union of South American Nations (UNASUR) as failed attempts at Latin American economic integration should look again. MERCOSUR has presided over an explosion in intra-regional trade among its four original member states (Argentina, Brazil, Paraguay, and Uruguay) from just over US$ 5 billion at its launch in 1991 to US$ 43 billion by 2014. UNASUR, for its part, is credited with thwarting a coup attempt against Evo Morales in 2008 and putting a damper on continental arms races. MERCOSUR and UNASUR member countries have taken additional important steps toward convergence since 2014, when MERCOSUR’s highest governing body adopted “CMC Decision 32,” which allows initiatives pursued by either collective to be binding on both if they arise from a set of goals and objectives common to both. The document reaffirms the UNASUR founding treaty stipulation that “South American integration shall be achieved through an innovative process that includes all of the achievements and advances by the processes of MERCOSUR and CAN [Andean Community].” Chile has spearheaded this effort as a means of reducing duplication of efforts, and is also attempting to bridge ideological differences between the Pacific Alliance (Chile, Colombia, Mexico, and Peru) and MERCOSUR to further build Latin American unity. Given the relentless negative assessment of both integration projects, multinational pharmaceutical companies were caught off guard when MERCOSUR and UNASUR forced them late last year to make substantial price cuts for public-sector purchases of Darunavir, an antiretroviral to combat HIV-AIDS, as well as Sofosbuvir, used with other medications to treat Hepatitis C. Both drugs are on the World Health Organization’s List of Essential Medicines. As a result of CMC Decision 32/14, the Ministers of Health of all the South American nations met in Montevideo on September 11, 2015, and launched a joint MERCOSUR/UNASUR committee to negotiate with multinational pharmaceutical companies on the prices for bulk purchases of certain high-priced drugs. The committee, made up of representatives from each government’s agency responsible for purchasing medicines, won major price cuts last November – a steep reduction for Darunavir from Hetero Labs as well as lower prices with Gilead for Sofosbuvir. The new costs were premised on the lowest amount charged to any one of the member governments, and enabled Chile’s Ministry of Health to pay 90 percent less than what it previously paid for Darunavir. The South American governments as a whole are expected to save US$ 20 million in 2016 on purchases of this anti-retroviral. A proposed 14 percent reduction in the cost of the combination Sofosbuvir-Ledispaver drug for Hepatitis C – if accepted by the MERCOSUR/UNASUR committee – would enable further savings. The South American governments have their eyes set on several additional high-priced medications, with a particular focus on drugs used to treat cancer. In order to aid the committee’s work, UNASUR is creating a data bank of the prices charged by the multinationals for specified medicines purchased by the public health sector in each member state. The fact that the purchases are made jointly through the Pan American Health Organization’s already existing Strategic Fund opens the possibility that countries in Central America and the Caribbean can benefit as well. It also means that all these countries can access the Fund’s capital account and do not need to have the cash in hand to acquire medications required to address public health emergencies. MERCOSUR and UNASUR – often dismissed as ineffective – are demonstrating that integration produces tangible results. * Thomas Andrew O’Keefe is President of San Francisco-based Mercosur Consulting Group, Ltd. and is former chair of Western Hemisphere Area Studies at the U.S. State Department’s Foreign Service Institute (2011-15). Correction: Due to an editing error, an earlier version of this post mistakenly stated that “a 14 percent reduction in the cost of its combination Sofosbuvir-Ledispaver drug for Hepatitis C will enable Chile’s Ministry of Health to pay 90 percent less than what it previously paid for Darunavir.” The outcomes of the cost negotiations for the two medications are unconnected. The seventh UNASUR head of state summit, held in Suriname in August, failed to give the organization the shot in the arm that it needed to continue developing as an effective voice for South America. Despite grandiloquent declarations that it was a “historic event” for the region, the summit was in danger of being overshadowed by several incidents. The son of Suriname´s President and summit host, Desi Bouterse, (who himself has a checkered past) was detained in Panama the day before the summit and extradited to the United States, where he faced drug- and arms-trafficking charges. (The son was subsequently charged with “attempting to support a terrorist organization” as well.) Moreover, four of the 12 UNASUR heads of state didn´t attend the Summit, and bilateral tensions between some of the participants got the meeting off to a rough start: Bolivia was irritated that Brazil gave asylum to a senator accused of corruption; Uruguay’s decision to expand a paper plant on the Paraná River peeved Argentina; Chile and Argentina were in a row regarding the Chilean airline LAN’s use of facilities in Buenos Aires; Chile and Peru continue a battle in the Hague about a territorial dispute; and Paraguay was still in limbo after being suspended from UNASUR (and MERCOSUR) after President Lugo’s removal last year by the Congress. 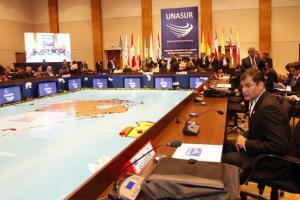 Even as the dust settled, however, UNASUR was unable to take on the most important task of the summit – appointing a new Secretary General for the organization. Despite their contrasting styles – sometimes complementary and sometimes in open competition – Presidents Chávez and Lula de Silva had driven the creation and consolidation of UNASUR after the end of the FTAA project during the Mar del Plata Summit of the Americas in 2005, but that strong leadership is not there anymore. Their absence laid bare the weak political will of most other South American leaders to consolidate the organization and to build a strong institutional basis for its development. No one, except perhaps former (and controversial) Paraguayan President Lugo has expressed interest in the job of Secretary General. It was no surprise, moreover, that the Summit was not able to advance other crucial decisions, such as the creation of the long expected Banco del Sur. A resolution condemning U.S. initiatives regarding Syria was one of the few relevant and consensual results of the Summit. UNASUR started out as a political endeavor based on regional, instead of national, interests, and much of its earlier momentum was driven by rejection of earlier “neoliberal” attempts at regional integration and of the role of the United States in the region. Members’ new focus is clearly state-centric and political, as regional market and trade issues have been superseded by a new agenda focusing on infrastructure and communications development, energy and security agreements, global financial impact and environmental concerns. The absence of new leadership to move forward a regional agenda poses a series of challenges to this process. In the meantime, other processes continue. Paradoxically, some of the member countries are deeply involved in the creation of a new initiative – the Pacific Alliance (Alianza del Pacífico), clearly oriented towards free trade. Coordination initiatives by Arizona and Colorado stand out as unique models for other U.S. states. The Arizona-Mexico Commission and its counterpart, La Comisión Sonora-Arizona, were founded in 1959 by the governors of Arizona and Sonora to coordinate local support for improvements to infrastructure, education, and security in order to benefit economic development in both states. In Colorado, the Biennial of the Americas was first organized in 2010 to highlight Denver’s role as a site of Pan-American cultural exchange. The second Biennial, held this summer, hosted art exhibitions and roundtable discussions of social issues facing the region. The trade and immigration focus of most of the state-level initiatives usually does not clash with Washington’s priorities and indeed are complementary of them. When the states’ initiatives do challenge the federal government, however, the courts usually come down on the side of the latter. 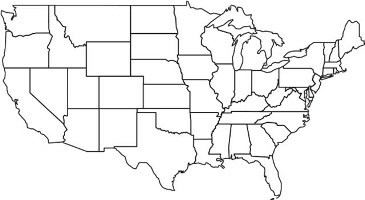 Yet when states have ultimately lost out to federal power, their actions have at times brought U.S.-Latin American relations to the forefront of national debate, such as when Arizona passed tough immigration laws in 2010. Bold initiatives from the states are rare, but there are alternatives to the standard trade-and-immigration fare. The binational approaches of Arizona and Colorado aren’t perfect – critics of the Biennial of the Americas note that corporations use it as a platform for their own interests —but the connections they build are valuable and promote progress by connecting actors with shared interests and developing economic and cultural organizations around those ties. Aaron Bell is a PhD candidate in the Department of History at American University.